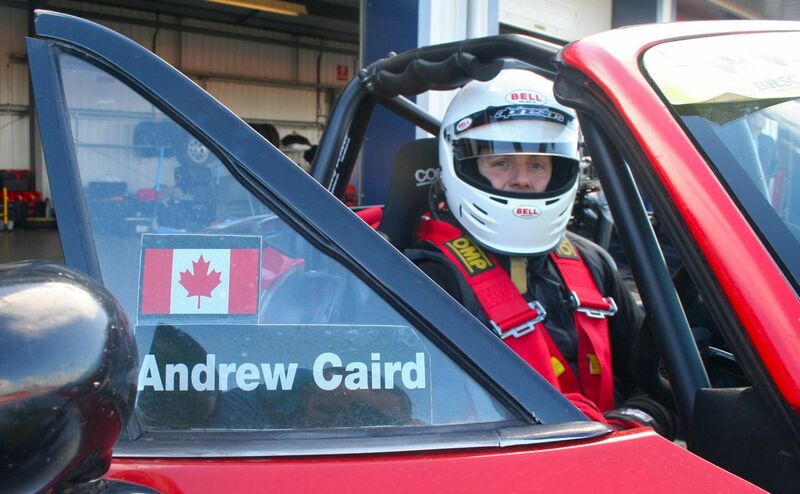 My previous racing experience is pretty limited to say the least, so when asked to join my friend, and now Mazda MX5 series driver Andrew Caird, for a track day, I was just a little nervous! I’m never one to turn down a challenge, and being offered such a unique opportunity I just couldn’t say no. 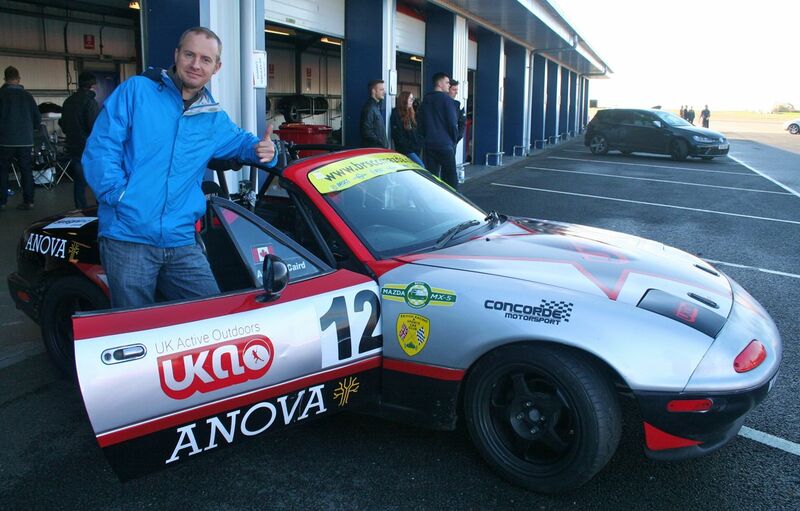 Andrew had organised this race day with a handful of friends to end a busy racing season in his Mazda MX5, also the car we would be using. This was going to put me completely out of my comfort zone, but life would be boring if we didn’t do it every now and then! We arrived at the Bedford Autodrome for 7am, and after a quick volume check on the car we headed in to sign in. My first look at the track layout was an eye opener, 3.8 miles of track with lots of tight bends and a very long looking straight. The nerves were starting to jangle too as we went past Aerial Atoms and Porches on the way in. After all, these would be racing around the track with us at the same time. We had a warm welcome by Javelin Tack Days who were running the event, and this is where I had to listen. Different coloured flags being waved whilst on the track meant different things, so I went over these again and again in my head as it was essential to get them right for the safety of everyone on the track. No overtaking on bends and passing on the left was also engraved in to my brain, which also put me a little more at ease as it meant if I was slow I could let the faster cars pass with ease. I actually came away from the welcome a little more confident and ready to get in the car. We headed over to the track and I was thrown straight into it. I jumped into the car ready for the first few laps, with Pip, another one of our racing group as my passenger. These laps were to check the track out and get used to the layout, it also gave me time to learn the race lines. Pip was great with the advice, and explained the racing lines, and how to use markers on the track to get those race lines correct. I was really starting to feel like I could race around the track safely. I came back in to the pits and Andrew sent me straight back out to start racing! I was just a little nervous as I headed out of the pits and straight on to a track where everyone else was now driving as fast as they could! I took it easy at first just following the race lines and using the cones, making sure I was moving over for faster and more experienced drivers, but I was soon taking corners faster and understanding how to use the width of the track to keep the power down. It was a great feeling to be doing 120mph up the straight and taking the chicane at speed but under control. Looking back at this moment, I’m glad Andrew sent me straight out racing because when I headed back in to the pits to swap with him, watching the other cars tearing past, wheels screeching, I may well have been a little more worried if i had been watching before going out. After a few of our group had driven the car around, Andrew took me out as a passenger. I thought I was going at a reasonable speed around the track until this moment! Andrew opened up the car and showed the me what a the little MX5 could really do. It stuck to the track like glue and the speed that he managed to get out of it was unbelievable. I actually felt a little sick when we arrived back at the pits, mostly from hanging on as we took corners faster that I thought was possible to get around them! It was a brilliant moment for me on the track to be shown driving in this way and the only time in the day that I would be overtaking other cars! Throughout the day I headed out on to the track for 6-8 laps of racing, each time building on my lines and braking, and slowly but surely I was speeding up. Thats not to say I didn’t overcook it as I did spin it a couple of times. Fortunately no other cars were close to me, maybe the reason I decided to test things out. After all the only way to get better is to make mistakes and learn from them, but they were still ‘heart in the mouth’ moments! Having a Porsche go past you at 120-140mph on a track is quite an experience too. It was a treat for me to see these cars flying around the track, and what could be done in all manner of cars with a bit of experience. I also had a bit of a one on one with a few cars, possible beginners too, just testing each other out, trying to get ‘a good bend’ to give you the oomph to overtake on the straights. It was all done with a little more space than in a race, but really exciting none the less. I heard a few comments in jest about the Mazda MX5 being known as a hairdressers car which I can kind of understand, but when these cars are racing around a track they are a different beast! I noticed a few people coming over and asking questions like “what engine have you got in that? !” to which the reply was “standard engine”. A very underestimated little car! I’m a huge fan now anyway, and have noticed them everywhere on the road since. 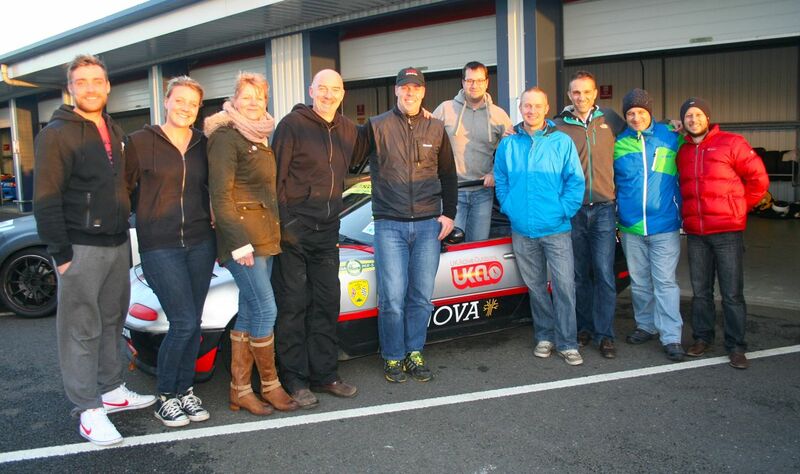 The atmosphere at the track day was really friendly and we often got talking to other drivers about their cars. It was nice to feel welcome as a newbie to motor sport, and made going back out on to the track a little easier. As the day went by, and with the track getting faster and faster, the cars were now whizzing by when overtaking. I managed to get a really good lap in near the end of the day, It wasn’t timed, but it felt fast and controlled, a little personal target hit and left me buzzing as the light faded and racing came to an end. I have covered a fair few activities over the years, but this has to be one of the few where I really felt like a fish out of water, but came away wanting more! A massive thanks to Andrew Caird for setting this up and inviting me to join him, it was a day I will never forget. 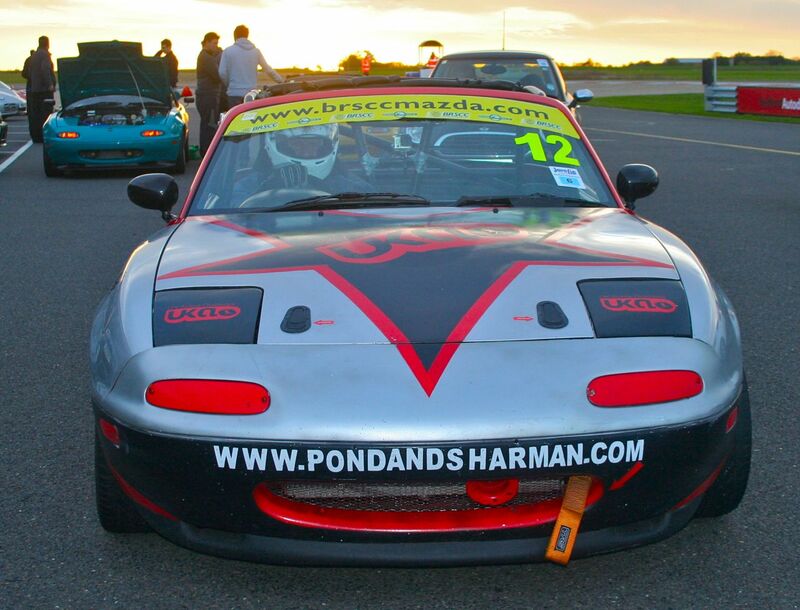 You might have even noticed the stunning art work on the car, yes thats us UK Active Outdoors, kindly added by Andrew for has previous race and for the track day. 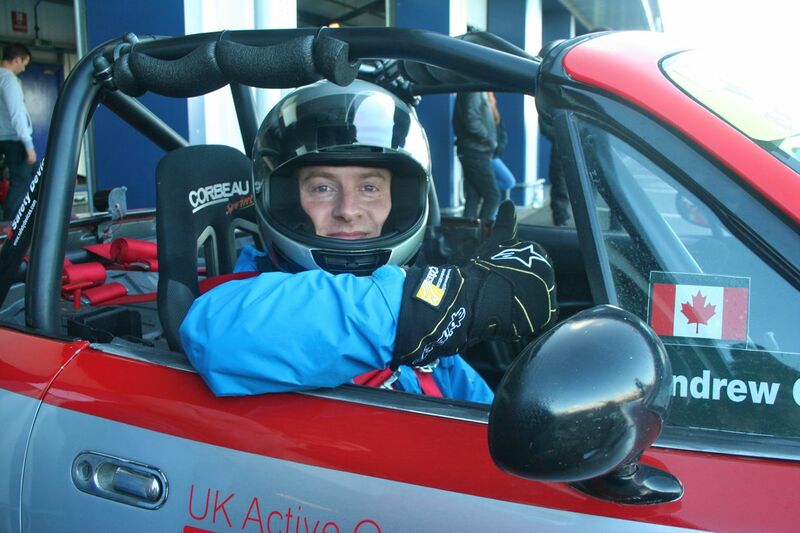 Interestingly Andrew is now looking into setting up a experience race day in the Mazda MX5’s, so watch this space! 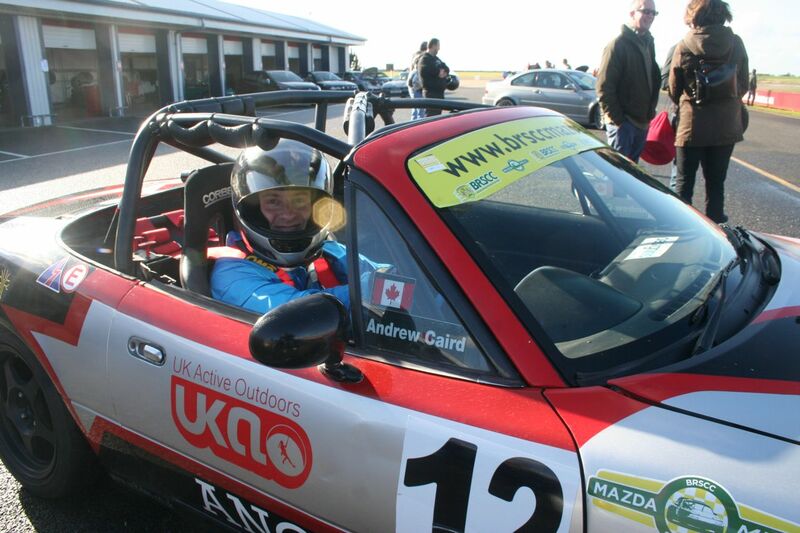 To find out more about Andrew Caird and the Mazda MX5 race series check out the following links.